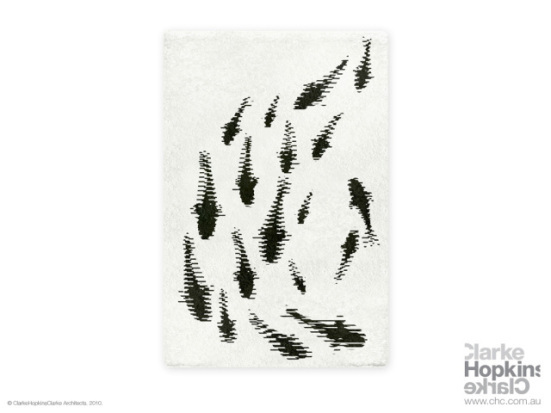 ... the rug itself, an almost 3-dimensional vision of carp swimming, exquisitely incorporating the water's ripples into the shadows of the fish. ... and the special glass coffee table, which when placed upon the Magic Carp-Pet, gives 'a lively' atmosphere to the interior. This you must see for yourself. the decreasing abundance of our most precious natural resource - water. intriguing little conversational piece on the floor." Source: ClarkeHopkinsClarke. John Leung's design studio is AARIVE.